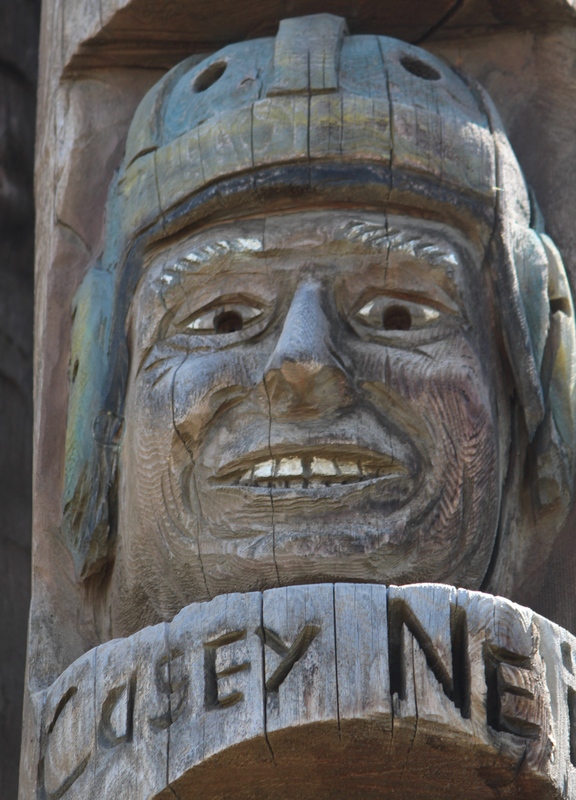 Colfax, Washington’s Codger Pole: Never too late for a rematch! | Oh, the Places We See . . .
It’s legendary, this story is, and pretty remarkable to boot: old guys playing a rematch just for the fun of it! And that’s why the Codger Pole in Colfax, Washington (between Pullman and Spokane on Hwy. 195) celebrates the idea that old rivalries don’t just die out. They sometimes get relived, even after 50 years. At least that’s how the story goes. In 1938, Colfax High lost a football match-up with St. John with a score of 6 to 0. But Colfax never forgot. After 50 years, one Colfax player, John Crawford had the idea to suit ’em up again and hit the gridiron. And so they did. With fanfare accorded to war heroes and the like, Colfax held a parade honoring the now 70-year-old players and turned out en masse to cheer the old codgers on at the rematch. Wearing their original colors (but not the original leather helmets), two aged but determined teams went head to head on a fall day in 1988. With a surprise run by Colfax’s Babe Lyons, it was a win for the Colfax Bulldogs reversing the original 6 to 0 score in their favor as they defeated the St. John Eagles! Ah, sweet revenge! 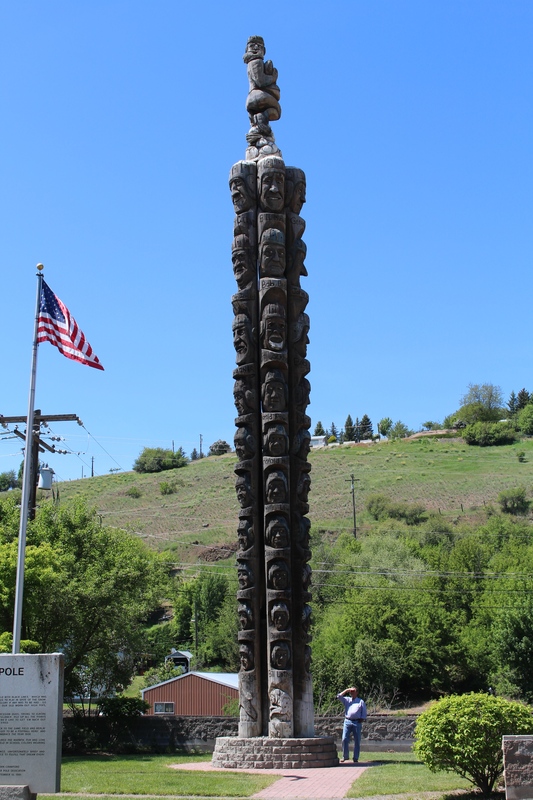 In 1991, the remaining players dedicated a 65-foot red cedar pole by master carver Jonathan Labenne — grown-up likenesses of all 51 players sculpted into the five standing poles known today as the Codger Pole. It’s said to be the largest chainsaw sculpture of human likenesses and the world’s largest football monument, but we like it for its Roadside America appeal and what it must have meant to the old codgers who took the field that day in 1988, playing the sport they loved. 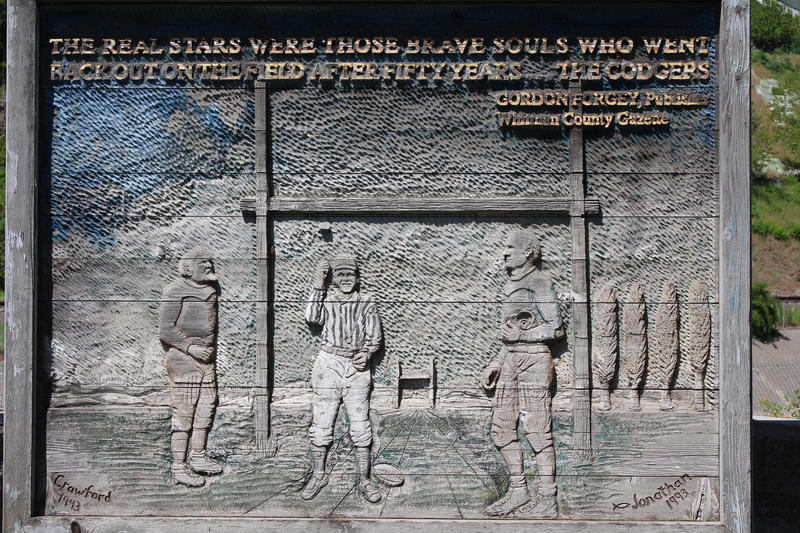 In the park commemorating the event is the The Codger Pole Legend with this insight by John Crawford: The ghosts of our youth revealed glimpses of gridiron brilliance. Unfortunately brief and few but even so, that glorious afternoon of fun gave us guys a chance to fulfill that dream every seventy-year-old kid secretly hangs onto: playing one more game. And how many old rascals ever get to do that? The real stars were those brave souls who went back out onto the field after fifty years — The Codgers! Even if you can’t get to Washington to see the pole, you’ll love the YouTube video narrated by one of the players, Joe Henderson, chronicling the whole event. (Click here.) The Codger Pole, 324 South Main Street, Colfax, WA For more information: “The Codger Pole.” Roadside America. Retrieved from http://www.roadsideamerica.com/story/2944 “Codger Pole.” Skeeterbuggins Productions on YouTube. Retrieved from https://www.youtube.com/watch?v=yNaS5mcdhiY To read more of our travels through the Inland Northwest, click on the page labeled Inland Northwest at the top of this blog. This entry was posted in Destination, Travel, Washington and tagged Codger Pole, Colfax, football, Inland Northwest, Joe Henderson, John Crawford, Jonathan Labenne, Washington. Bookmark the permalink. 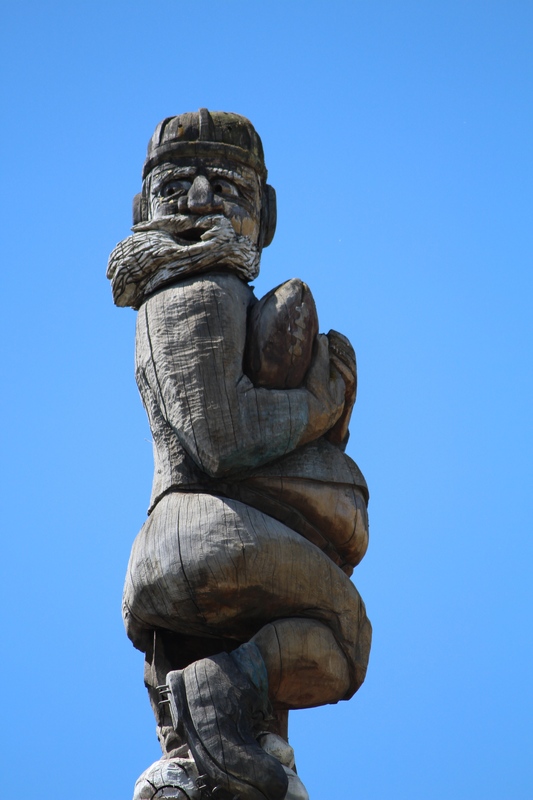 7 Responses to Colfax, Washington’s Codger Pole: Never too late for a rematch! Such a great story! Thank you for sharing it with us! You are so welcome! I love the story, too. Wish some old codgers I know would have a rematch around here — would be fun to watch. I can’t believe they could field two teams of 70-something players. Good for them! It’s a great story, for sure, and I’m glad we stumbled upon the Codger Pole just by reading some tourist info brochures. Appreciate the comments. What a cool idea for an urban statue. A great tribute to the locals to keep real local history alive. I agree. And it was neat that they used the likenesses of the men at their old age — around 70 — rather than as the boys who played the original game. Thanks for taking a look!